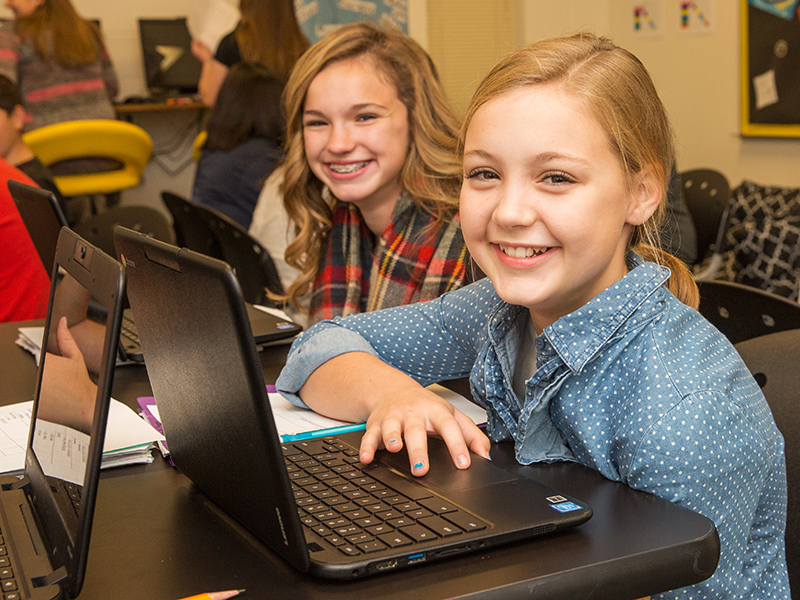 Students at Cisco Junior High School can choose from a variety of different options for working with other students. For the most part, students have autonomy in choosing whether they want to work independently, with a partner, or in a group. This autonomy extends to choosing their partners and group members as well. Sometimes teachers intervene, however, when students are not making good choices of partner or group. Teachers at Cisco will also create groups when beneficial to students. After reviewing student progress data they may determine small groups or pairings that would work best together based on similar learning needs (e.g. instruction, practice, challenges). These data can be formal, such as assessment scores, or informal, such as class observations of progress. Teachers may also work with students, reviewing their data together and discussing what pairings might be best for them. Cisco creates opportunities for collaboration to increase learning enjoyment and student engagement. The school recognizes that students naturally want to work together, spending time with their friends and peers. Cisco has worked hard to create these opportunities while also ensuring that collaboration is productive and beneficial to learning. Student collaboration at Cisco provides students with opportunities for deeper learning, having to put what they’ve learned in their own words as they work with others. Teachers have also noticed improved communication between students as collaboration has increased. Self-selects into small group instruction as needed. Chooses appropriate groups or partner based on how they work best and what they’re working on. Chooses to work independently if desired. Works with peers in teacher-created groups when applicable. Creates intentional groupings when needed. Guides student choices when they may not be making the best decision for their learning. Cultivates an environment where partners and group members promote student learning. Provides a data source for teachers and students to reference when thinking about partner and group choices.